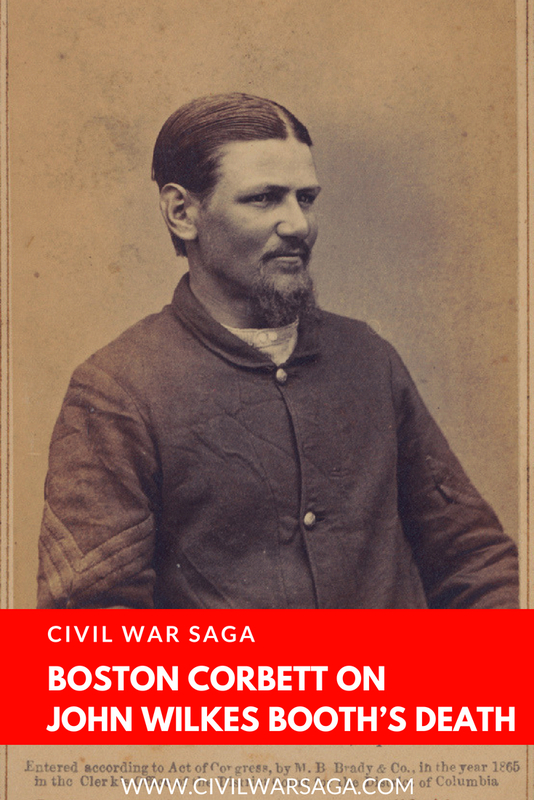 Boston Corbett was the sergeant who shot and killed John Wilkes Booth on April 26, 1865 in Port Royal, Va.
Corbett, whose real name was Thomas P. Corbett, was a London immigrant and a deeply religious man who changed his first name to “Boston” after experiencing a religious conversion at a church revival in Boston, Massachusetts in the 1850s. Corbett later joined the Union army at the outbreak of the Civil War and eventually became a sergeant in the 16th New York Cavalry. 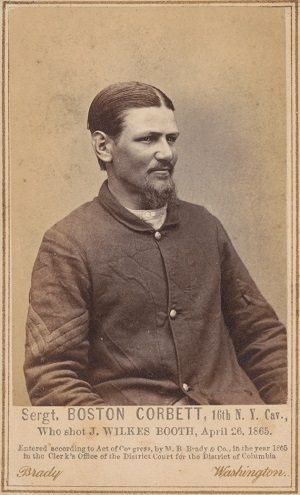 On April 24, 1865 Corbett was one of the selected cavalrymen from his unit sent to hunt down John Wilkes Booth, who was still at large after assassinating Abraham Lincoln the previous week. Corbett’s detachment unit tracked down Booth and his accomplice, David Herold, at Garrett Farm in Port Royal, Va and found them hiding in a tobacco barn. The troops set the barn on fire and ordered them to surrender. Herold complied but Booth refused, saying they would never take him alive. Corbett said that he approached the barn and when he saw Booth through a gap in the wall, he fired. He was quickly arrested for disobeying orders but was eventually cleared of any wrongdoing. Since the day of the shooting, many sources have stated that Corbett deliberately ignored orders to take Booth alive and fired upon him out of revenge for Lincoln’s assassination. “LINCOLN BARRACKS, WASHINGTON, May 11, 1865. DEAR BROTHER BROUGHTON: I thought it high time to keep my promise and send you a letter and at this time I thought it might be desirable, as there are many false reports in the papers charging me with violation of order, &c., in shooting BOOTH, but my commanding officer of the expedition not only clears me from all blame, but recommended me to the attention of the Commanding-General, for my untiring exertion to bring the murderer to justice. He was a desperate man, and fully determined to die rather than to be taken alive; and it was only when it was actually necessary that I shot him. When I first saw him by the light of the burning hay, he turned toward the fire, either for the purpose of putting it out or else of shooting the one who set it on fire. I was on that side, and then he was quite near to him, and I had a full front-breast view of him, and it would have been much easier to have hit him then than when I did, but I waited till I was satisfied his purpose was to use his arms and try and fight his way out of the door that HARROLD had just been taken out of. I then fired on him, and he fell, and when I saw where the ball had struck him — in the neck, near the ear — it seemed to me that God had directed it, for apparently it was just where he had shot the President. H. HARROLD’s trial is now going on. I do not know how long it will be before I may be allowed to return home, but I should like to do so soon by furlough, if I cannot obtain my discharge.